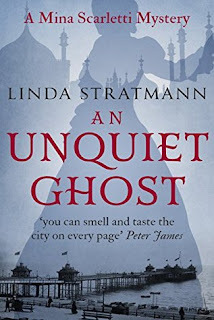 Welcome to the next stop on the blog tour for Linda Stratmann's latest Mina Scarletti novel, An Unquiet Ghost. They are George Fernwood and Mary Clifton, betrothed distant cousins with a family secret that is preventing them from getting married. Twenty years ago their alcoholic grandfather died in his bed. Though the official verdict was accidental poisoning rumours have been circulating that someone in the family murdered him. In An Unquiet Ghost, the third of a series, Mina Scarletti, an author of children’s stories and also horror stories written under a pseudonym, has a reputation for unmasking fraudulent spirit mediums. Not having read the first two books in the series, I wasn't sure what prompted her to become involved with spiritualists, although reference is made to the mediums she did debunk and an enemy she made doing so. This wasn’t a problem as An Unquiet Ghost is written in such a way as to be enjoyed as a stand alone novel. It just means that I'm now very keen to read the previous two. I expected a much darker book with spine-tingling séances and ghostly visitations but wasn't too disappointed when the story didn't go down that path. The two mediums that Mina investigates use other methods and I enjoyed how Mina tried to work out these methods while keeping an open mind. For answers, she reads scientific journals and seeks medical explanations from an oculist and also her physician, Dr. Hamid, an interesting character who forms part of Mina’s inner circle of friends. Another of her friends, a former conjuror's assistant, suggests a way of testing one of the mediums and Mina's brother, Richard, is also persuaded to help, despite becoming involved in a fraud of a different kind. Most of the action unfolds through letters and lots of dialogue. Given that Mina has a deformity and other health problems which restrict her mobility and with the wintry weather keeping her housebound, it was totally believable that the story unfolded in this way. The result of one lengthy discussion had Mina questioning the influence of her horror stories on her readers. Designed to entertain, were they furthering the cause of the spiritualists? This is not the only time she questions her beliefs. When her trust is betrayed, she faces the dilemma of revealing a deception or ignoring it due to the happiness it brings. The murder mystery element was intriguing. There were a few clues, none of which I picked up on, so that when the murderer was revealed it came as a surprise. Linda Stratmann has created a wonderful character in the diminutive Mina Scarletti. What Mina lacks in stature, she makes up with intelligence, courage and determination. The various secondary characters, taken from a cross section of Victorian society, added more colour to the narrative and rounded out a well plotted and very entertaining novel. As mentioned previously, I am keen to read the first two books. It looks like I have found a new series to follow. Thank you to Sapere Books for the invitation to participate in this blog tour and for a free copy of the book to read and review. The ebook can be purchased here. Linda’s love affair with the printed word started when she was two, when her mother, a keen reader, taught her the alphabet. She has had her nose in a book ever since. By her teens, she had developed an absorbing and enduring interest in true crime and history and a special fascination for the Victorian era. 2003 saw the launch of her first published book, Chloroform: the Quest for Oblivion. Several true crime books were to follow, most recently The Secret Poisoner, a study of nineteenth century poison murder, and three biographies, including The Marquess of Queensberry: Wilde’s Nemesis. Linda’s first fiction series, the Frances Doughty Mysteries set in 1880s Bayswater, features a clever and determined lady detective. 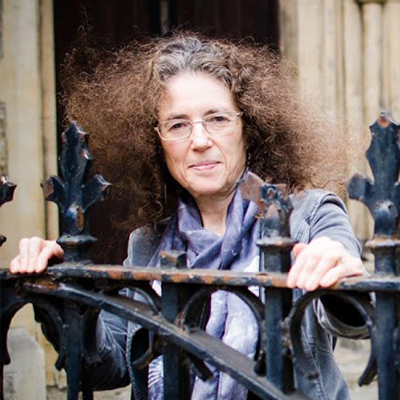 Through her adventures, Linda explores aspects of Victorian life such as diet, education, medicine, women’s rights, fear of premature burial and the fashion for cycling. In her second series, set in 1870s Brighton, Mina Scarletti is a deceptively diminutive lady who writes horror stories and exposes the activities of fraudulent spirit mediums. Linda is delighted to be an active member of the Crime Writers’ Association, and was elected Vice-Chair in 2017. You can get in touch with Linda via her website or follow her on Facebook, Twitter and Instagram. A full list of Linda’s books can be found on Goodreads. The best murder mysteries are those where you can't figure out who the killer is, so this sounds good. I totally agree. I find it very disappointing if it's obvious who the murderer is.